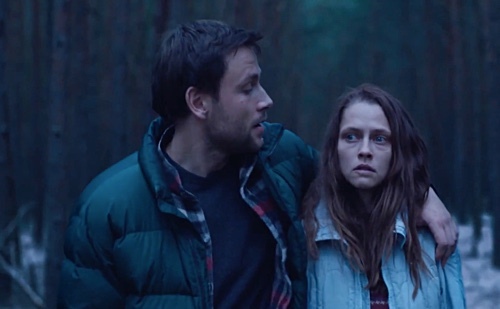 Cate Shortland’s “Berlin Syndrome” is an intriguing portrait of a man and a woman in a rather… complicated relationship, the former being a psychopath (Max Riemelt) and the latter a tourist being held captive in an isolated apartment (Teresa Palmer). Although the picture is deliberately paced with something curious happening just about every other scene, it suffers from a lack of catharsis which is particularly difficult to pull off in a thriller. At times it is particularly trying to sit through because we wonder if or when Clare will finally decide to fight back against her delusional captor. Palmer and Riemelt deliver highly watchable performances. Palmer has a knack for playing a character whose wings had been clipped. The picture’s early scenes showcasing Clare’s freedom in a foreign country in contrast against having to survive in a limited space where not even windows are capable of being opened, Palmer touches upon the loneliness and desperation of the character. The performer is at her best when emoting in a scene by herself. She reminds me of lite-Kirsten Stewart, a bit more versatile in her body language and not relying on facial contortions too much. Meanwhile, Riemelt expertly balances being charming and sinister. It is eerie how Andi is shown as a teacher by day and a creep, to say the least, during his free time. Sometimes we can read every expression on his face and each thought that crosses his mind. But there are instances, too, when he is completely unreadable and this is when the monster reveals itself. Unlike Palmer, Riemelt is in his element when reacting with a co-star, whether it be Palmer or Matthias Habich who plays Andi’s father. I wish Andi’s relationship with his father had been explored further considering that there are hints in the dialogue that Andi’s life at home might have contributed to shaping Andi’s pathology. It is both admirable and frustrating that the material is consistent on making a conscious choice to avoid the expected trappings of a story involving a kidnapped woman. On one hand, because it adopts an unconventional rhythm and pacing, occasionally the story is quite unpredictable. Initially, I was certain that Clare would it make it out of the apartment alive. Over time, however, I began to doubt a little since the character’s inner fire gets weaker. On the other hand, although the captive deserves her revenge, the final few minutes is uninterested in this. Indeed the choice to end the story where it did, despite it being quite unsatisfying, is a logical one. Beautifully photographed especially when contrasting between indoors and outdoors, adventurous viewers are likely to appreciate “Berlin Syndrome” because there is a freshness to it when it comes to the writing and directorial choices, but casual audiences are probably going to dismiss it outright since it does not hit the usual or expected beats. I respect its vision and confidence.